Click here to view a slideshow from the workday. U.S. Ambassador to Armenia Richard M. Mills, Jr. and volunteers from the U.S. Embassy’s Helping Hands organization continued an annual tradition by joining the Fuller Center for Housing Armenia team Saturday in Aghavnatun village of Armavir region to help build a home for Petrosyan family. Within a few hours the volunteers finished concreting the floors, a huge step forward for the family. 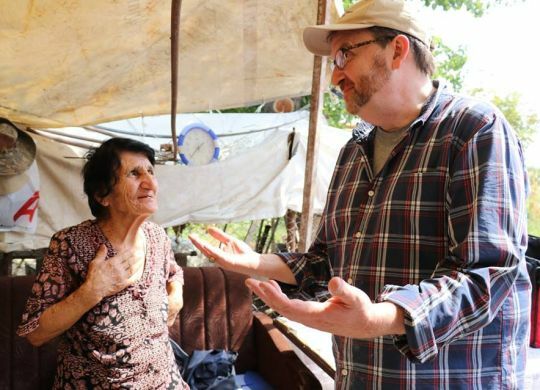 It’s the eighth year the U.S. Embassy team has joined forces with the Fuller Center for Housing Armenia to build homes for Armenian families in need of decent housing. The Petrosyans have lived in a metal container since 1995. They have lived in a small room with no bathroom and no kitchen — just a small bedroom without proper roofing and flooring. In 2015, they finally were able to build the walls of their own house but could not afford to finish it. “Housing is a basic human right that is vital in everyone’s life and I am glad that we are united in our conviction and dedication to making a difference in the lives of families in housing need,” Fuller Center for Housing Armenia President Ashot Yeghiazaryan said.